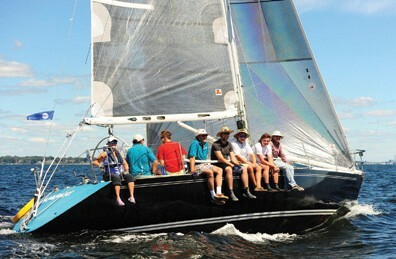 In Stamford Yacht Club’s 80th Vineyard Race over Labor Day Weekend, the Sacred Heart University Keelboat Team, based at SAIL BLACK ROCK in Black Rock, CT, sailed Dave Otterbein’s Tripp 37 Breakaway (Stony Point, NY; Nyack Boat Club) to first place in PHRF Class 5 and second in the Seaflower Course fleet. Breakaway, celebrating her thirtieth anniversary of competing in the Vineyard Race (she was the overall fleet winner in 1984), was one of four boats competing in the Corinthian Challenge division for youth and collegiate sailors. Otterbein remarked on the crew’s hard work and a great team effort, and White enjoyed Stamford Yacht Club’s lavish tented lawn party. “One of the best awards ceremonies I’ve ever attended featuring Chinese, Mexican, freshly baked s’mores and gear vendors,” he said.